Will a ‘flipped’ classroom work for you? A growing number of teachers are ‘ﬂipping’ their classrooms by encouraging students to do school work at home and homework at school. But there’s a bit more to it than that, according to educators who have introduced the model. It might sound like a gimmick, but the growing number of educators who’ve ‘flipped’ their classrooms claim it has the potential to revolutionize learning. The concept, which is a grassroots movement that many schools have adopted, turns the traditional pedagogic process on its head, and appears to complement the values of the IB curriculum. Instead of introducing a new topic in class and then setting homework, students are first learning content online at home independently, via video lectures and podcasts, and then doing their ‘homework’ in class. But there’s more to the model than posting lectures on YouTube, says IB educator Jason Graham. “Teachers should look beyond the integration of modern technology and into the pedagogy,” he says. To help get this message across, he and Maggie Hos-McGrane, Director of Educational Technology at the American School of Bombay in India, have launched a series of Flipping Classrooms workshops to help IB educators understand the idea. The small but very active group, which came together for the first time at an IB Regional Workshop in Singapore, was a mix of administrators and teachers of various subjects across all three programmes. Also available online, feedback from both workshops has been positive. The aim of the workshops, which cater for varying degrees of technical abilities, is to help teachers differentiate and cater for learning styles, especially EAL (English as an additional language) learners or those who need extra support and practice. In addition, the extra support at home and thinking time for students to engage with the content allows them to feel better prepared and ready to explore and engage with content and their peers. Traditionally, according to Jon Bergmann and Aaron Sams, pioneers of the flipped model, the dissemination of information was considered the best use of teachers’ time in the classroom. A flipped classroom offers a learner-centred approach and is designed to provide students with active involvement in their knowledge construction. The flipped model encourages student participation and frees up time for more practical work in the classroom, involving teachers and students in discussions and problem solving. Bergmann, in his article ‘The Biggest Hurdle to Flipping your Class’ (2013), argues that we need to get away from direct instruction to the whole group and instead use class time for richer and more meaningful activities and interactions. At PYP level, the workshops have used the flipped model as a tool to help get parents more involved. Students at Ihsan Dogramaci Bilkent Erbil College (IDBEC) in Kurdistan, Iraq, have been able to immerse parents in their physical learning, says PYP Kindergarten 2 teacher Anna King. Students now film their work, and their learning goes beyond tablets and computer games, making them realize IT is useful for information and sharing, not just entertainment. Lorena Menay, IB Diploma Programme teacher at The Mackay School in Chile, attended the workshop as she already uses technology in the classroom, but was looking for a way to help students become active participants in learning. 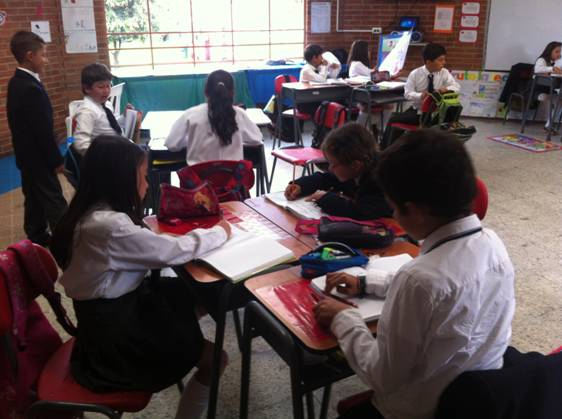 She says: “The technology in my classes is an experience of positive and challenging learning. It has given me the opportunity to connect with my students differently. What’s more, the flipping model works hand-in-hand with the IB philosophy that recognizes students as active members of the learning process, and transforms the learning and teaching experience where learning responsibility is shared. In the Flipping Classroom workshops, participants are guided in the process of planning and delivering a successful ﬂipped classroom model from start to finish. This covers background information about the flipped model, tips for organizing content, instructions on how to produce and distribute videos, and strategies for making the most of time in the classroom.